9 Degree raked "Tricky Trees"
Tricky Air & Billet's 9 degree "Tricky Trees" are made out of T-6 6061 billet Aluminum and allow you to bolt on 9 degrees of additional rake. 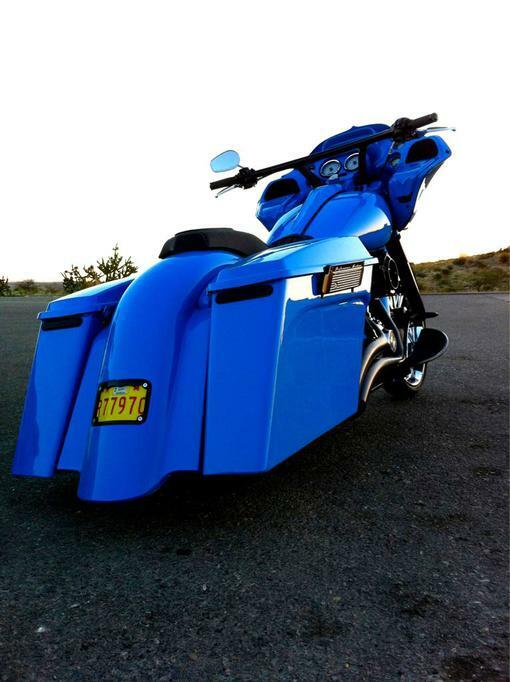 Your FLH frame has 26 degrees on the neck already from Harley. Your factory steel trees have another 4 degrees of rake for a total of 30 degrees. "Tricky Trees" have a true 9 degrees of total rake changing your over all rake to 35 degrees. We have spent alot of time figuring out geometry, rake and trail for our trees. 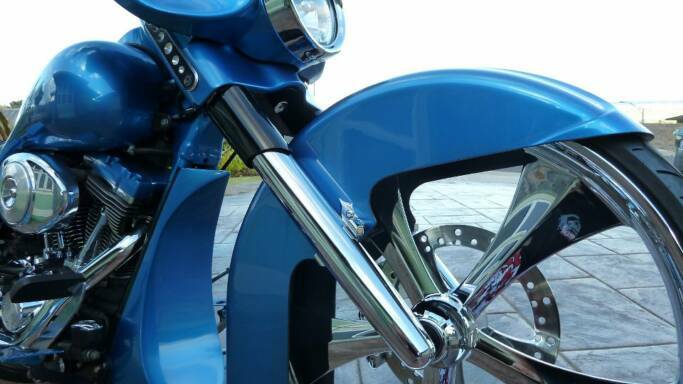 With "Tricky Trees" there is no need to cut your bikes neck in order to obtain the raked look your looking for. Nobody wants to take a brand new bike off the showroom floor and cut the frame when they haven't even made there first payment yet. Should this keep you from the look you want? "Tricky Trees" let you fit up to a 26'' wheel and tire while still using your factory legs. Because you will be placing a bigger size wheel/tire on to your factory legs then what Harley intended,we recommend a couple of changes. With a 21'' wheel you can use your factory stock springs,there is even enough room to lower you bike 1'' with lower springs and thicker fork oil PJ-1(30wt). With a 23'' or 26'' W/T we recommend changing your inner fork springs. Progressive makes stock height stiffer springer's which lets you adjust for higher pre load (Part#11-15-36). TAB recommends using PJ-1 (30wt fork oil). This is a must! : A "Limiter" in the lower section of your legs is a must, whether or not you do not change your inner springs (Bad Idea if you don't) you need to limit the travel of your front forks. For a 26" w/t = 1''dia. X 3.25'' long PVC & for a 23" w/t = 1"dia. X 2.75". This is just a recommendation, test this first by compressing your suspension completely to insure at least .25" of clearance between bottom of TAB tree & your new fender. This is made to reduce the 4.5'' travel of your stock legs so your fender and bottom tree do not hit. 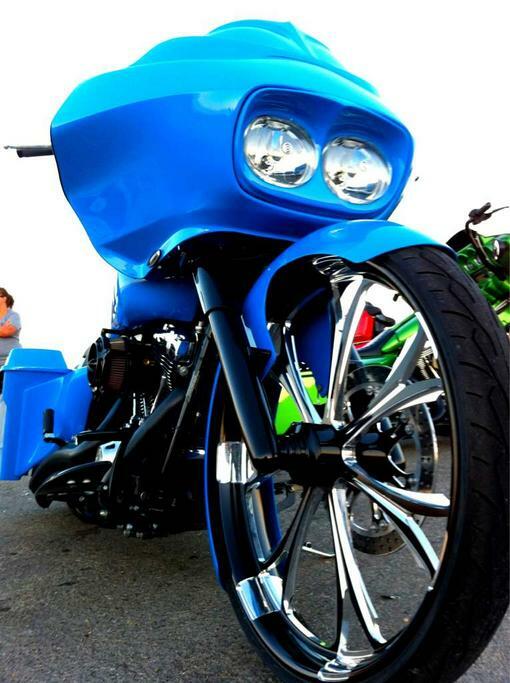 In the motorcycle world, stance is everything. 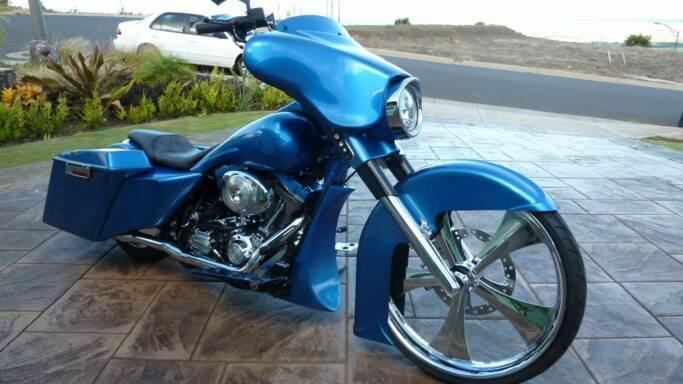 This is a 2010 HD-FLH with only our 9 degree "Tricky Trees" holding a 23'' wheel and tire. Remember there is no cutting of your frame needed to run our "Tricky Trees"! 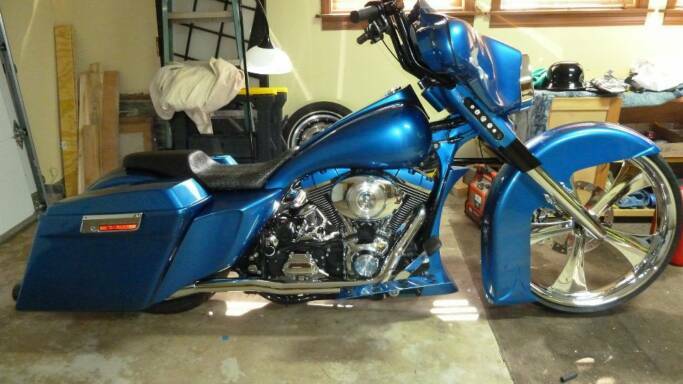 This is Mark's 2010 HD-FLH with only our 9 degree "Tricky Trees" holding a 23'' wheel and tire. Remeber there is no cutting of your frame needed to run our "Tricky Trees"! "Tricky Trees" with front Tricky Air-Suspension Forks holding a 26"
The trees will come pre-assembled in the box with 2-3.5" long grade 8 bolts and 1" spacers for your stock risers. A 1x14'' nut for our stainless steel stem which has been already bolted to the bottom of the tree. The bottom tree comes with two laser cut brackets mounted on it for proper headlight alignment (no need to purchase any other alignment parts). Any further questions please contact us. 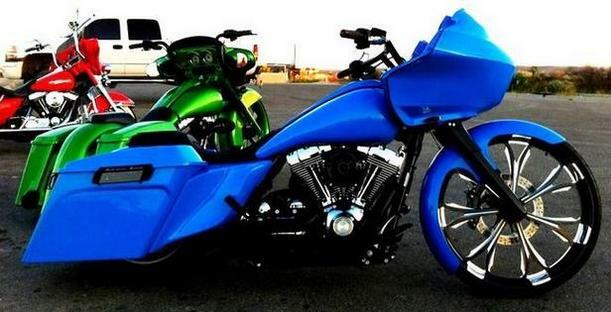 This is what your bike would look like if you used our "Tricky Trees" and cut your frame an additional 10 degrees. The "Tricky Trees" are the best foundation even if you decide to cut your neck. What if I want to cut my neck? "Arnie,I have a total rake of 45 degrees with your 9 degree trees,and the bike rides like a dream no matter what speed I go.Thanks again Paul from Hawaii". 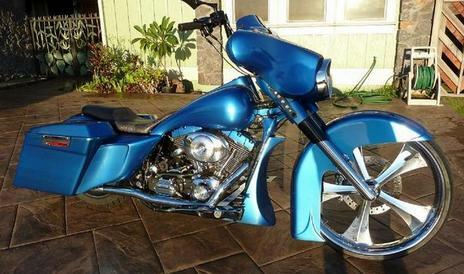 Ricco's Roadglide has no rake cut on the frame. 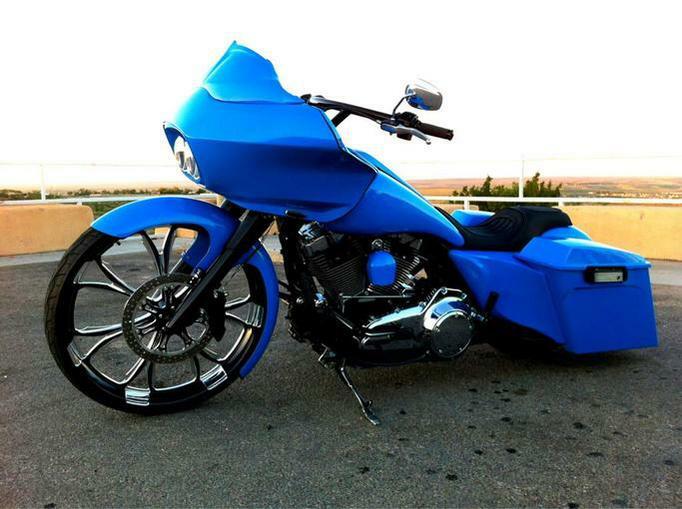 This Roadglide only has our 9 degree "Tricky Trees" with a 26" wheel. Ricco's looking real good!! This is just a quick video of "SERIES 001" RG doing 110. FYI: We get a lot of phone calls from potential customers asking "Why do I not have to cut the neck? This other company says I have to". TAB 9 degree "Tricky Trees" are not engineered like all the other trees out there. When we first invented the 9 degree trees we made them with a 55mm leg diameter for our air-suspension front forks. 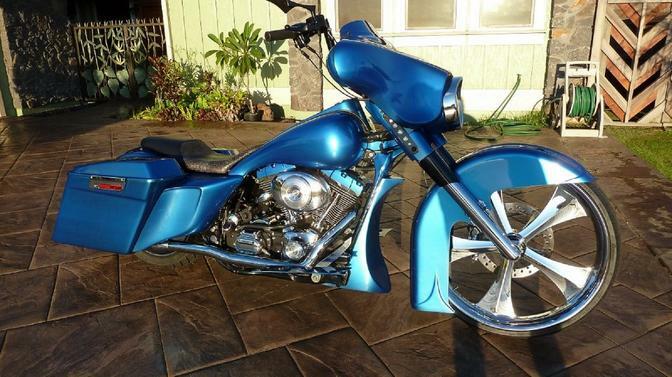 We introduced them at the V-Twin show back in 2008. That was the same year we decided to make them in 41mm for the stock legs. The biggest difference between our trees and any of our competitors trees is the correlation between the neck stem location and the angel of fork leg hole. This is one of our trade secrets. If you need to know more just give us a call.